Most commonly reported postoperative complications of Frey's procedure include sepsis, delayed gastric emptying, and endocrine insufficiency. Here, we report unusual complications such as gastric outlet obstruction and intussusception following Frey's procedure in the late postoperative period. 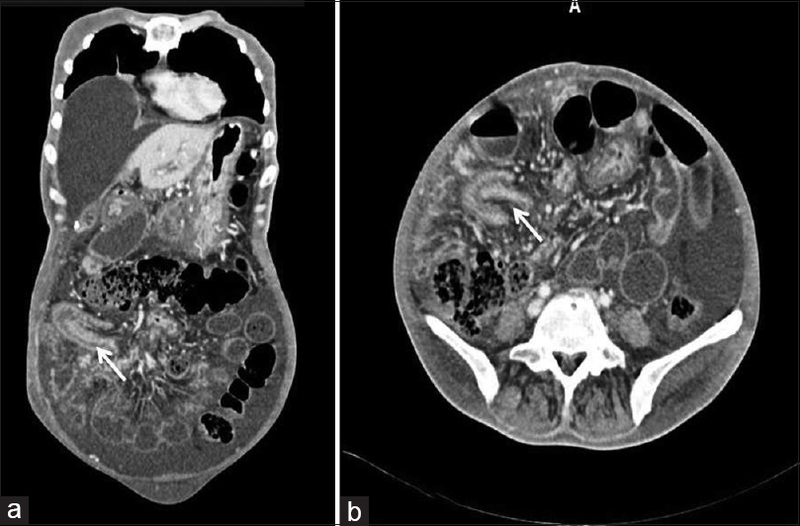 A 40-year-old patient with chronic pancreatitis with common bile duct stricture who underwent Frey's procedure, presented with recurrent vomiting episodes 3 months postoperatively. Contrast-enhanced computed tomogram (CECT) abdomen showed features of gastric outlet obstruction. A gastrojejunostomy was carried out. 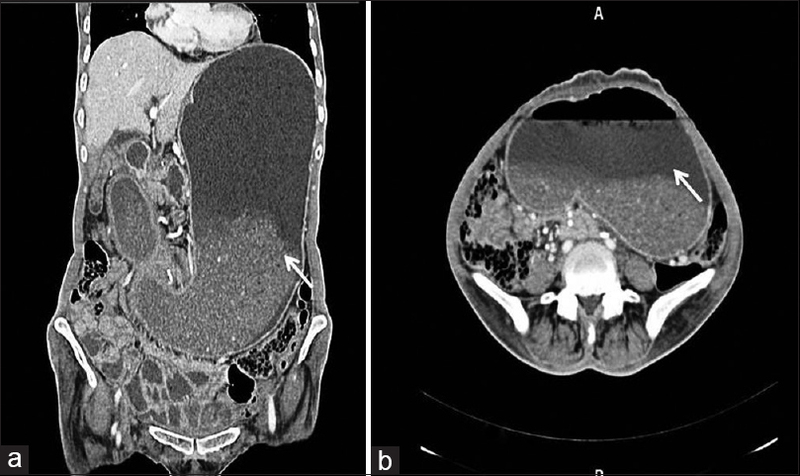 The patient was asymptomatic for 2 months following which the patient presented with features of jejunojejunal intussusception confirmed on CECT, which was managed conservatively. The patient remains asymptomatic on follow-up for the past 9 months. Our experience reveals that although reports of such complications following Frey's procedure are rare, gastric outlet obstruction and intussusception can occur following Frey's procedure, and hence, the surgeon should have an index of suspicion in patients with atypical presentation. Chronic pancreatitis is a debilitating disease associated with intractable pain, exocrine, and endocrine pancreatic insufficiency. Among the various surgical procedures described for chronic pancreatitis, Frey's procedure has been reported to provide excellent pain relief with minimal mortality and morbidity. It provides optimum pain relief as well as preserves the exocrine and endocrine functions. Postoperative complications following the Frey's procedure are usually septic in nature and are more often in patients who had prior endoscopic interventions. Currently, delayed gastric emptying (DGE) is recognized as the most common procedure-related morbidity with an incidence of 8%–45%. There is a paucity of reports in the literature where a mechanical cause of obstruction was identified following Frey's procedure. To the best of our knowledge, there are no reports of gastric outlet obstruction following Frey's procedure, and only one case of intussusception following Frey's procedure has been reported. Here, we report unusual complications such as gastric outlet obstruction and intussusception following Frey's procedure in the late postoperative period. A 40-year-old female patient diagnosed with a case of chronic pancreatitis and distal common bile duct (CBD) stricture was referred to our center given recurrent episodes of acute pancreatitis and intractable pain following failed endoscopic retrograde cholangiopancreaticography for stone retrieval. The patient was found to have features of chronic pancreatitis and a biliary stricture involving mid and distal CBD in CECT at the time of presentation to our center. Liver function test (LFT) revealed total bilirubin of 3gm/dl but was not clinically jaundiced. The patient underwent Frey's procedure combined with hepaticojejunostomy after improving the general condition. Hepaticojejunostomy was carried out during the primary surgery (Frey's procedure) for deranged LFT and as choledochojejunostomy was not possible due to the stricture and fibrosis of mid and distal CBD. She had an uneventful postoperative course and was discharged on the 10th postoperative day. Three months following the surgery, the patient presented with complaints of recurrent episodes of nonbilious vomiting. On examination, patient was found to have abdominal distension and was dehydrated. There was no icterus and LFT was within normal limits. Contrast-enhanced computed tomogram (CECT) of the abdomen showed grossly distended stomach up to the right iliac fossa, thus confirming the diagnosis of gastric outlet obstruction [Figure 1]. Exploratory laparotomy was carried out as the patient failed to respond to conservative measures. Exploration revealed dense adhesions of the first and second part of the duodenum to the area of hepaticojejunostomy leading to gross dilatation of the stomach [Figure 2]a. The Roux limb which was anastomosed to the pancreas appeared normal and was not dilated [Figure 2]b. Adhesiolysis was not attempted as the fibrotic area was close to the hepaticojejunostomy site. A gastrojejunostomy was done to bypass the obstruction following which patient made an uneventful recovery. Two months later, the patient presented with features of intestinal obstruction. On evaluation, ultrasonogram and CECT abdomen revealed jejunojejunal intussusception which responded to conservative management [Figure 3]. The patient remains asymptomatic on follow-up for the past 9 months. Surgical intervention is now being considered as the most effective therapeutic option for intractable pain in patients with chronic pancreatitis. Among the various procedures described, Frey's procedure has been found to significantly improve the quality of life of these patients in all the domains. Postoperative complications following Frey's procedure are often septic in nature. Many short-term complications have been reported which includes hemorrhage, pancreatic leak, and DGE. The most frequently associated long-term complication is endocrine insufficiency. DGE has now emerged as the leading procedure-related morbidity and has been attributed to the method of reconstruction which may cause transient torsion or angulation of duodenojejunostomy. However, the most DGE resolves spontaneously with prolonged gastric decompression and other conservative measures. There is a dearth of reports in the literature, where a mechanical cause for obstruction was identified and treated. Rajamahendran et al. in a series evaluating the short-term outcomes following Frey's procedure had reported a case with jejunojeunal intussusception at the jejunostomy site 2 months postoperatively. The authors performed a relaparotomy and did disconnection of jejunojejunostomy, and a new side-to-side anastomosis was fashioned between the pancreatic limb of the jejunum and afferent limb of jejunum. Similarly, our patient had developed gastric outlet obstruction owing to adhesions at the hepaticojejunostomy site which was managed by a gastrojejunostomy after which patient developed a jejunojeunal intussusception which responded to conservative measures. Although a subclinical leak at the hepaticojejunostomy site could have led to the formation of adhesions in this case, our experience reveals that although reports of such complications following Frey's procedure are rare, gastric outlet obstruction and intussusception can occur following Frey's procedure, and hence, the surgeon should have a high index of suspicion in patients with atypical presentations. Gastric outlet obstruction can be an unusual complications following Frey's procedure with hepaticojejunostomy. Intussusception, although not directly related to Frey's procedure, was an incidental finding in the postoperative period. Although uncommon, GOO and intussusception should be considered in patients with atypical presentations in the late postoperative period. The authors would like to thank Dr. Deepak Bharathi, Associate Professor, Department of Radiodiagnosis, Jawaharlal Institute of Postgraduate Medical Education and Research, Pondicherry for his help in reviewing the imaging studies of the patient. Pessaux P, Kianmanesh R, Regimbeau JM, Sastre B, Delcenserie R, Sielezneff I, et al. Frey procedure in the treatment of chronic pancreatitis: Short-term results. Pancreas 2006;33:354-8. Chaudhary A, Negi SS, Masood S, Thombare M. Complications after Frey's procedure for chronic pancreatitis. Am J Surg 2004;188:277-81. Schäfer M, Müllhaupt B, Clavien PA. Evidence-based pancreatic head resection for pancreatic cancer and chronic pancreatitis. Ann Surg 2002;236:137-48. Rath S, Meher S, Basu A, Priyadarshini S, Rout B, Sharma R, et al. Quality of life after Frey's procedure in patients with chronic pancreatitis. J Clin Diagn Res 2016;10:PC10-5. Rajendran R, Amudhan A, Prabhakaran R, Duraisamy B, Vellaisamy R, Kannan D, et al. Head coring for chronic calcific pancreatitis without pancreatic head mass: Short-term outcome analysis. Int J Hepatobiliary Pancreat Dis 2014;4:62-9.